• Sir Simon Rattle, in his first season as the music director of the London Symphony Orchestra, is the subject of a recently opened exhibition at the Barbican Music Library. Rattle follows the life of a man now considered one of the world’s foremost conductors, from his birth in 1955 to the present day. Featuring photos, awards, video, letters, programmes and unseen items from family collections, it’s curated by his first manager, Martin Campbell-White, and Edward Smith, former CEO of the City of Birmingham Symphony Orchestra and has been organised by the LSO in partnership with arts management company Askonas Holt. The free exhibition runs until 22nd December. For more, follow this link. 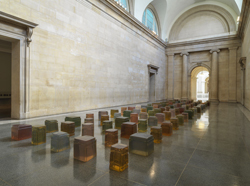 • The works of Rachel Whiteread, one of the leading artists of her generation, have gone on show at Tate Britain. Spanning the three decades of her career, the show has everything from four early sculptures displayed in her first solo show in 1988 to works made this year especially for Tate Britain with scales ranging from the monumental to the intimate. Whiteread came to public notice in 1993 with the East End unveiling of her first public commission, House, a concrete cast of the interior of an entire terraced house. She won the Turner Prize the same year and represented the UK at the Venice Biennale in 1997 and has had solo exhibitions of her work in museums and galleries including The Solomon R Guggenheim Museum in New York City, the Serpentine Gallery in London and the Museums of Modern Art in Rio de Janeiro and Sao Paolo. Highlights of the show include Untitled (Room 101) 2003, a cast of the room at the BBC’s Broadcasting House which was thought to be the model for Room 101 in George Orwell’s Nineteen Eighty-Four, a selection of Torsos – casts of hot water bottles, and Untitled (One Hundred Spaces) 1995, an installation of 100 resin casts of the underside of chairs (pictured). Runs until 21st January. Admission charge applies. For more, see www.tate.org.uk/visit/tate-britain. PICTURE: Courtesy of Tate Britain. • An exhibition which focuses on the use of prints as an “object of trade” opens at the British Museum today. The business of prints, based in part on Antony Griffiths’ prize-winning book The Print Before Photography: An Introduction to European Printmaking 1550-1820, focuses on four major areas – the production of prints, the lettering on prints, the usage of prints and the collecting of prints and the concern for quality. Delving into the museum’s collection of more than two million prints, it features works by the likes of Durer, Rembrandt and Goya alongside those of far less famous artists. The display can be seen until 28th January in Room 90, the Prints and Drawings Gallery. Entry is free. For more, see www.britishmuseum.org.